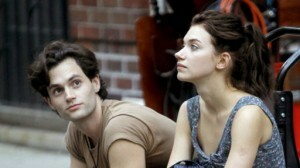 Penn Badgley and Imogen Poots star in Greetings from Tim Buckley. Penn Badgley (TV’s Gossip Girl) stars as musician Jeff Buckley, son of late iconic folk singer Tim Buckley, in the 2012 music-filled independent drama Greetings from Tim Buckley. In 1991, a young Jeff Buckley (Badgley) rehearses for his public singing debut at a Brooklyn tribute show for his late father. Struggling with the legacy of a man he barely knew, Jeff forms a friendship with an enigmatic young woman (Imogen Poots, Solitary Man) working at the show and begins to discover the powerful potential of his own musical voice. In a short time, Jeff finds the courage to perform at the now legendary St. Ann’s concert, where Jeff discovers his own voice singing his father’s songs, captivating the audience and launching his own meteoric career. Directed by Daniel Algrant, the unrated film also stars Ben Rosenfield as Papa Tim, William Sadler (Restitution) as musician Lee Underwood and Broadway veteran Norbert Leo Butz as legendary music producer Hal Willner. Following a film festival rollout (at Tribeca, Toronto and Newport, notably), Greetings from Tim Buckley received a limited release to U.S. theaters in May, 2012 to generally positive notices, garnering an average 6.2/10 rating based upon 29 published reviews at Rotten Tomatoes. Bonus features on the DVD include interviews with stars Badgley and Poots and director Algrant.